Cala Mondrago, on Majorca's south-east coast, is a delightful resort which lies in the National Park. Situated around a sheltered bay and framed by woods, with a soft sandy beach and warm clear waters, it exudes an atmosphere of peace and relaxation. It is a firm favourite with young families and couples. If you are seeking a completely chilled out break, a cheap Cala Mondrago holiday would be the perfect choice. Many low cost airlines now fly to Majorca from regional airports so travel to the island has never been more convenient or cheaper. With fairly short flights you can be basking in sunshine in next to no time. The holiday season lasts from April to October with temperatures rising into the early thirties at the height of the season. Cala Mondrado offers high standards of both accommodation and service. You'll find it is a friendly and welcoming resort where every effort is made to make your stay a holiday to remember. Since the resort is isolated, most meals are provided by the hotels. Similarly, there are few shops but you can take the bus to Cala D'or. As for nightlife, the atmosphere never changes whether it is the sun or the moon that is shining. Again, those seeking a lively evening can go to neighbouring Cala D'or. If you want to sunbathe on soft sand with an occasional dip into the calm aquamarine waters, you have chosen well. The water is shallow perfect for small children. 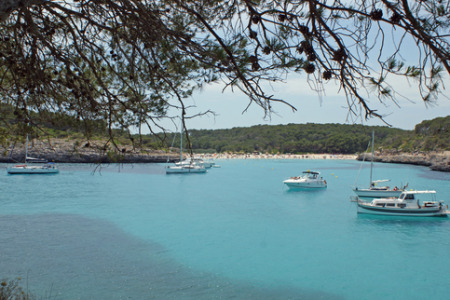 Cala Mondrago holidays also appeal to nature lovers and hikers as the national park has many interesting walking trails. If you wish to explore the wider area and neighbouring resorts, car hire is recommended. Cheap holidays to Cala Mondrago. If you fancy a cheap Cala Mondrago holiday but find the task of trawling through web page after web page in an attempt to find the best deal more than a little off-putting, try our simple search facility. You'll find over three dozen travel companies competing for your custom. It is simple to use and remember, competition brings out the best bargains. Our search facility enables you to see, at a glance, the Cala Mondrago holiday that is the cheapest and the one that offers you the best value for money. All you have to do to secure the holiday is make a phone call. To book the best deal, and to avoid disappointment, ring today.